- Nate Freese equals disaster for Lions. Period. 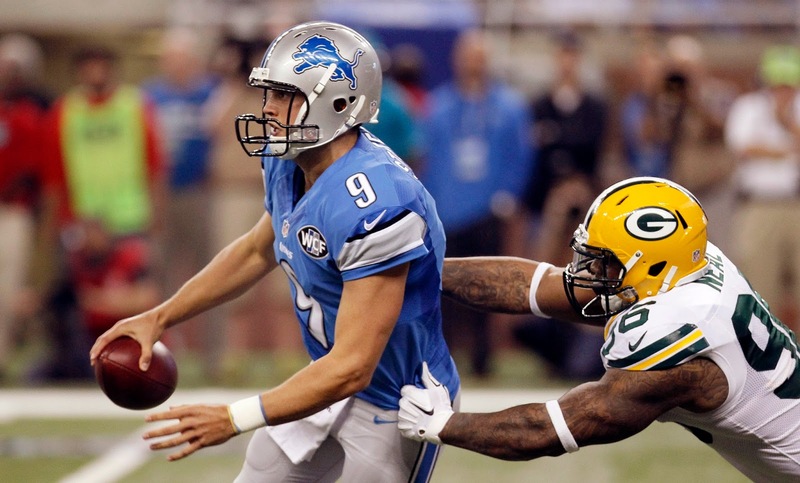 - The Lions' defense has been outstanding so far. They've contained Aaron Rodgers with the exception of one play, forced two turnovers, scored eight points and have shutdown the Packers' running game. The Lions offense has been the lesser of the two units the last two games. - I've got news for you all: DeAndre Levy, not Ndamukong Suh, is the Lions' best defensive player. Levy was brilliant last season. If anything, he's been even better this season. It was yet another terrific play by Levy when he garnered a safety early in the second half. It changed the course of this game dramatically. - I take back what I wrote about Corey Fuller. That was a outstanding play on the 52-yard reception near the end of the half. Maybe it was a good evaluation by the Lions' coaching staff after all. - I don't see the need for Matthew Stafford to try to force the ball deep to Calvin Johnson in double coverage. The idea was to get more weapons surrounding Stafford and Johnson so that would no longer be necessary. Yet, for the second straight week what did we have in the first half Sunday? Stafford picked off throwing deep to a well-covered and double-teamed Megatron It's nonsensical. - Loved the crossing route out of a tight formation to Calvin Johnson early in the second quarter. It was a creative way to get Johnson the ball in space and take advantage of his under-utilized ability to run after the catch. - Lions' fans everywhere were holding their breath when Nate Freese lined up for a mere 30-yard field goal. They had a sigh of relief when he made it. Not very comforting, is it? - The Lions got little creative on defense, too, looping Suh and Nick Fairly on third-and-long for the Packers late in the second quarter. The result. A sack for Suh, his first of the season.